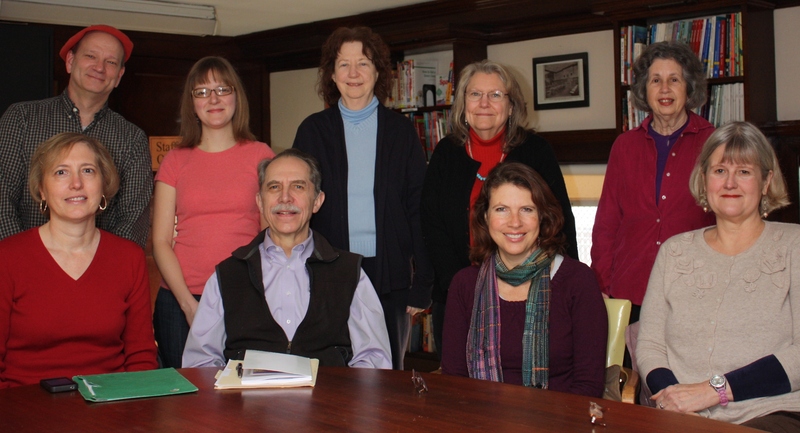 Jamaica Pond Poets (photo below), founded in 1995, participates in a variety of literary activities each year, many in cooperation with other groups in the Boston area. The group sponsors Chapter and Verse, a literary reading series directed by members Dorothy Derifield, Sandra Storey, and a committee of other members, at the historic Loring-Greenough House in Jamaica Plain. At the 2016 Massachusetts Poetry Festival, April 29-May 1, Jamaica Pond Poets read LOL poems followed by an open mike for others who read funny poems . Jamaica Pond Poets is a Poetry Partner of the Massachusetts Poetry Festival. Jamaica Pond Poets has read as a group at the Winter Solstice event at Jamaica Pond and at Forest Hills Cemetery’s Poetry in the Chapel Series. The group was selected to conduct a participatory reading at the both the 2012 and 2014 Massachusetts Poetry Festivals. Jamaica Pond Poets has purchased and donated dozens of poetry books by contemporary poets (most of whom reside in the Boston area) to the Boston Public Library and continues to do so. The books are kept at the Jamaica Plain Branch Library near the corner of South and Sedgwick Streets (near the Monument), and are available for check-out. The group has provided assistance to the Friends of the Roslindale Library in setting up a reading series there, Rozzie Reads, that includes an open mic. Jamaica Pond Poets meets every Saturday morning in the Jamaica Plain neighborhood of Boston to creatively comment on one another’s poems. Members of Jamaica Pond Poets (JPP) have been published in literary magazines and quite a few have had collections of their poems published. Several have won awards for their work and published poems and chapbooks (See About the Poets). Group members also frequently read at various area events and give workshops as individuals. As of August, 2017, active members include Mary Birnbaum, Dorothy Derifield, Carolyn Gregory, Audrey Henderson, Holly Guran, Susanna Kittredge, Dorian Kotsiopoulos, Jim LaFond-Lewis, Jennifer Markell, Alan Smith Soto, and Sandra Storey. Members emeritus include Alice Kociemba, Sybille Rex, and Gary Whited. For more information about the group’s availability, contact us. The Jamaica Pond Poets include (top row, left to right) Jim LaFond-Lewis, Susanna Kittredge, Sandra Storey, and Holly Guran (bottom row, left to right) Dorian Kotsiopoulos, Gary Whited, Jennifer Markell, and Carolyn Gregory. Not pictured: Mary Birnbaum, Audrey Henderson, and Alan Smith Soto.